Finally: a groovy app to support today’s customers. Casengo enables SMEs to offer efficient customer service with a new communication technology: a commonsense combination of email and live chat. A public beta version of world’s smarter customer support app will be released today. Casengo is what web shops and other small businesses have been waiting for since realizing that email tends to prolong resolution of enquiries and slow down response rates. The new cloud-based app, developed by an international team in Amsterdam, is unique in two ways. 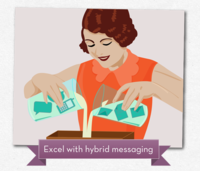 For one, Casengo introduces a new technique called hybrid messaging. 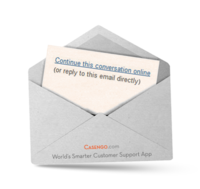 By combining email with live chat, even the tiniest web shops can now deploy live chat to support their customers more efficiently: every email sent from the Casengo application includes a link to respond via chat if so desired, keeping the conversation flowing. Hybrid messaging allows less tech-savvy SMEs to benefit from live chat without having to install a chat widget on their website. By turning static emails into dynamic real-time chat conversations, we can all stop playing those cumbersome games of email ping-pong. It’s WhatsApp for businesses! Secondly, Casengo allows its users to track cases easily across channels. The app automatically groups each customer query (a ‘case’) in a single timeline, regardless of the communication channels used by either customer or company. This means that whatever has been said through email or chat can be viewed in a single case history. This form of case management is common sense, really. It results in shorter response times, a higher first contact resolution and happier customers. Moreover, this new social customer support software is always free for the first agent. The Casengo application has been road-tested extensively by the Dutch branch of Takeaway.com, one of the world’s leaders in online food ordering. Almost 50 customer service representatives now work with Casengo, resolving well over 1.000 customer queries each week. Bad service and slow delivery are the best way to make sure customers don't ever come back, new research shows. Dutch customer service software provider Casengo delved into the online world of negative customer reviews in e-commerce, stepping into unknown yet rather instructive territory. Dutch customer service software provider Casengo presents the world’s first multichannel platform with a WhatsApp integration. The prototype, the result of a 24-hour “hackathon”, will be rolled out over the next couple of weeks. A consortium of European investors led by venture capital firm henQ injects $2 million (€1.5 million) into Casengo. This cloud application empowers companies to respond to their customers faster and better, without losing the human touch. 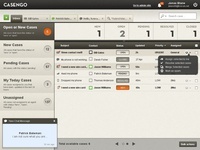 Casengo, launched in December 2012, is now used by over 2,300 businesses worldwide. Casengo, the cloud application that helps SMEs deliver first-rate customer service, introduces its easy and rewarding Affiliate Partnership Program. Casengo Affiliates can now earn €100,- for each new paying user.